Unenclosed upland forming part of Clwydian hills towards the northern end of the landscape area. The character area falls in the south-east corner the ancient ecclesiastical parish of Bodfari. Like the Penycloddiau character area it lay within the commote of Dogfeilyn in the medieval cantref of Dyffryn Clwyd, later to become the medieval lordship of Ruthin, the crest of Clwydian hills at this point having formed the boundary between Dyffryn Clwyd and the cantref of Tegeingl, along the historic boundary between the counties of Denbighshire and Flintshire. Prehistoric activity in the area is represented by two Bronze Age mountain-top cairns near the summit of Moel y Parc. 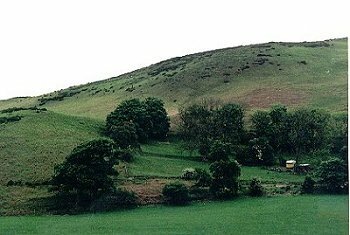 Prominent, round-headed hill forming distinctive landmark mid-way along the Clwydian hills and forming part of the Clwydian Range AONB. Upland area running along the top of the Clwydian hills, between 125-398m above OD, rising steeply to the south of the Aberchwiler valley to the north and the vale to the west, and sloping more gently to the east. Most of the area is registered common land. The foundations of at least one rectangular long hut towards the south-west side of the area suggests seasonal upland settlement during possibly the late medieval or early post-medieval periods. Unimproved, treeless upland pasture similar to the Penycloddiau and Moel Famau character area to the south but physically separated by the band of enclosed fields running up onto the hills at Aifft. The summit of the hill is generally rough grassland, with extensive areas of bracken and clumps of gorse on the slightly lower ground, above the margins of the enclosed land, managed by periodic burning off. The lower margins of the area are defined by post and wire fences and in places by low field banks with grown out hedges replaced with post and wire fences. Small sheep scrapes on steeper ground. Access by network of old paths and tracks running up the stream valleys to the west. Prominent telecommunications mast just outside the character area, to the east.